« HeidelErg - live from the Erg Chebbi in Morocco (#1): Exploring physical geography and 3D GIScience in an aeolian sand dune field. At the recent EuroGEOSS Workshop in Geneva, LandSense researchers from IIASA and Heidelberg University hosted an interactive mapping session to showcase the power of crowdsourcing for map validations as announced earlier. 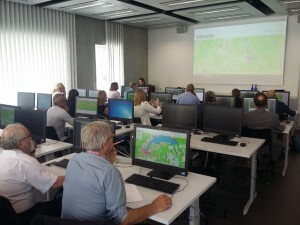 Using the openly available Land Cover Validation Platform (LACO-Wiki), participants collaboratively validated a land use and land cover map of Geneva, which brings together data from both earth observation (ESA’s Sentinel 2) and OpenStreetMap data streams (see soon more at OSMlanduse.org, read also here). During this session participants gained first-hand knowledge on how microtasks distributed to a crowd can be an efficient approach to validate maps using high resolution satellite imagery. Furthermore, degree of agreement between the contributors was presented as a means of addressing the quality and confidence of the crowd-driven approach. The session was very successful with validations of some 750 points within just 15 minutes! Participants including members of the academic community, industry and representatives from the European Commission’s Executive Agency for SMEs. LandSense partners will launch a series of such interactive mapping sessions in the upcoming months to contribute to the world’s first crowdsourced global land use map. The event is a prequel to our upcoming release of a conterminous/gap-free Sentinel-2 and OSM based land use map for all EU member states, as announced recently. The final map will be featured on osmlanduse.org, stay tuned as we are very exited for the upcoming map release. See here for further related references.